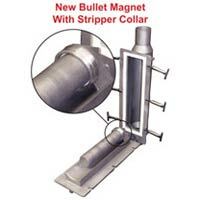 Industrial Magnetics, Inc. - Bullet Magnet Now 30% Stronger! Bullet Magnet Now 30% Stronger! Home / Company Information / Press Releases / Release: Bullet Magnet Now 30% Stronger! For Immediate Release: Posted On 1/31/2008 By Industrial Magnetics, Inc.
IMI’s trademark Bullet Magnet, used in dilute phase pneumatic systems to capture and remove metal fines and weakly magnetic steel, has been redesigned for a 30% increase in magnetic strength. Already the strongest industry-wide, IMI’s re-designed Bullet magnet features a new EZ-Clean Collar in place of a stripper tube to remove collected tramp metal from the magnet. This eliminates a barrier between the product flow and the magnet and allows for a higher metal capture rate. The Bullet magnet can be used ahead of processing equipment and bulk load-out systems to purify product and prevent costly equipment damage from metal contamination.